According to The Back School, “Effective ergonomic design reduces fatigue, discomfort and injuries; and increases job satisfaction, productivity and quality of work.” If a proper fit is established between the end user and their job, the musculoskeletal stresses on them are reduced, they are more comfortable, and they can do things more efficiently and effectively. The very definition of ergonomics is the science of fitting the task to the person, not forcing the person to fit the task. And thus we have two great challenges. 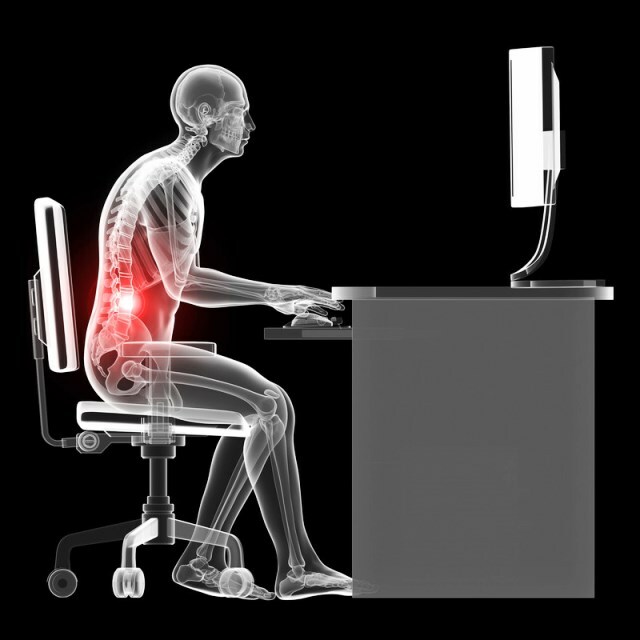 You may be working in a properly designed workspace and yet without the knowledge of proper posture, you can still subject your body to serious injury. This issue is only compounded if you’re working in a poorly designed workspace with the same lack of knowledge. This is a recipe for disaster and a perfect storm for the development of musculoskeletal disorders. The average person spends more than 8 hours per day sitting, and according to the National Academy of Sports Medicine, low back pain affects 80% of all adults. Low back pain is predominate among workers in enclosed workspaces, as well as people who sit for greater than 3 hours per day. More than 1/3 of all work related injuries involve the trunk, and of these, more than 60% involve the low back. Did you catch the stats above? The average person sits more than 8 hours per day and you’re at risk if you sit for more than 3. 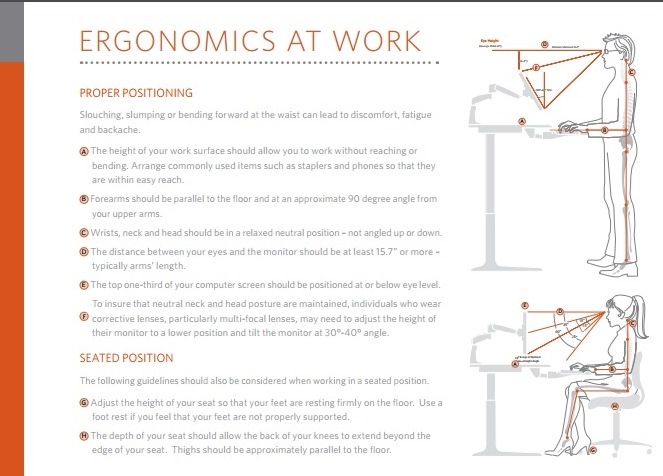 Now you might think that you don’t sit 8 hours per day at your job, but remember, ergonomics and the importance of good posture is not just confined to the office. 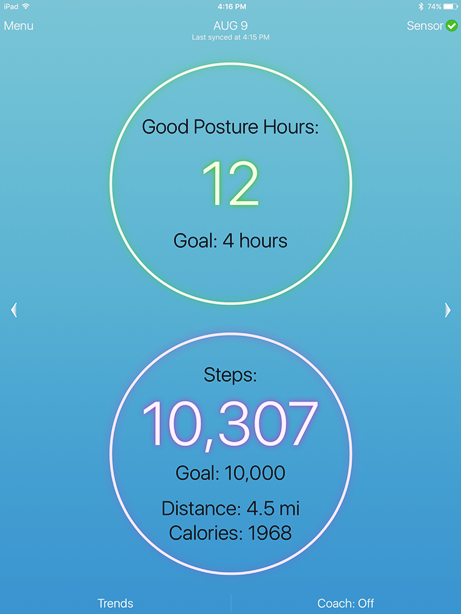 From the moment you get up in the morning until you go to bed at night, everything you do with your body is either helping or hurting…and all forms of sitting add up. This means the time at your breakfast table with your morning coffee, the drive to the office, lunch with clients, the commute home, dinner with family, and an evening in front of your flat screen…it all adds up to stress on your body. The following will focus on the office environment, however the applications are relevant to all parts of life. And a special note to athletes or fitness enthusiast. You can hit the gym six days a week following a great program, using perfect form, and still end up with a wrecked body by ignoring proper posture throughout the rest of the day. So what is good posture while keying at a desk? I like to start at the floor and work up. Your feet should be flat on the floor with your chair adjusted low enough that you can slip your hand between your thigh and the seat cushion right behind the knee. The insures that you’re not restricting blood flow to your lower legs. The angle from the knee to hip should be fairly level. There are allowances for a slight forward or backward tilt depending on personal preference. The key to the upper body is maintaining a neutral spine. Your shoulders should be relaxed with your elbows at your sides and your forearms relatively level with the floor. The acceptable angle of your forearms is actually 90 to 120 degrees which gives some flexibility again based on your preference. The total of the three is your level of risk. Basically if you sit like the photo below for a good portion of each day, most days of the week, you’re body is going to be a wreck. A functional workstation should adapt to you verses you having to adapt to the workstation. ANSI BIFMA, a regulatory organization for the commercial office furniture industry, recommends at least two points of adjustment with a workstation. So if you’re working at a fixed height desk, adding a keyboard tray and monitor arm are your best options. If you’re fortunate enough to have an adjustable height desk, the desk itself counts for one point of adjustment with a monitor arm being the best additional component. Even in this scenario, there are benefits to using a keyboard tray as this allows for maximum flexibility with your body whether working seated or standing. The use of monitor arms can be a vital piece in achieving proper posture. People using fixed height monitor stands tend to position them on the back on their desk which places the monitor potentially too far from the eyes. Instinctively this position encourages the end user to “perch” up on the edge of their chair in an effort to see their monitor. By using an adjustable monitor arm, the position of the monitor can easily be adjusted to the correct horizontal distance from the eyes while allowing the end user to still sit back properly in their chair. Awkward body postures: maintaining an unsupported static posture or performing an awkward posture such as bending, reaching, or twisting. When working in a non-neutral position, joint space may be reduced and muscle length may not be optimal. In static postures for greater than 20 seconds, muscles fatigue quickly because blood flow is restricted – and muscle substitutions may occur. Repetition: doing the same motions over and over again. When using the same muscle groups repeatedly, muscles & tendons don’t have enough time to rest which leads to fatigue as well as tissue damage & irritation. Contact stress: pressure on the soft tissues of the body by tools or sharp edges. This can lead to injury due to nerves & tissues being compressed. 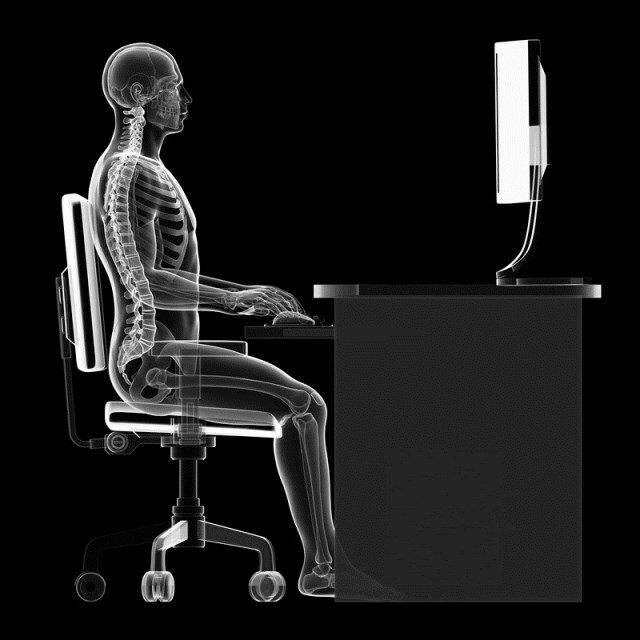 Working on a computer is not a highly demanding activity and yet it can negatively affect smaller localized or postural muscles. For example, the neck, shoulders, and upper back are highly engaged to support the head when positioned too far forward or when overly reaching to use a mouse. Muscles are used in lengthened or shortened positions causing them to be inefficient and resulting in possible fatigue or overexertion. Holding a limb in a static position uses a sustained muscle contraction which squeezes the blood vessels and decreases blood flow. The muscle doing the sustained contraction becomes fatigued even though there is no movement. At the same time, the reduced blood supply to the rest of the limb accelerates fatigue in the moving muscles, making them more susceptible to injury. Non-neutral postures can compress nerves leading to numbness and tingling, pain and weakness. Tendons and their sheaths can rub on bone and ligaments which can lead to irritation, fraying and or swelling. Contact stress occurs when part of the body rubs or compresses against a component of the workstation. Two examples are the blood circulation being cut off by contact with the front edge of the chair or the elbow resting on an arm rest compressing the ulnar nerve. The key point is that pain experienced from poor posture is not free. It’s not like having a little headache from a stressful day that subsides once your body and nerves calm down. The pain you feel from poor posture is doing damage to your body that will only compound with time. Just how much is corporate America spending on MSD’s or musculoskeletal disorders? MSDs are the leading cause of pain, suffering and disability in American workplaces. MSDs have a huge financial burden, but the human costs are the best motivation for prevention. MSDs account for one-third of all workers compensation costs. MSDs account for almost 400,000 injuries every year. Direct costs of MSDs are $20 billion a year. Total costs are estimated to be between $45-54 billion. Indirect costs (lost productivity, product defects, etc.) of an MSD case can be up to five times the direct costs. MSD cases require 38% more lost time days than the average injury/illness. Your company needs to generate over $8 million in additional sales to cover $260,000 in MSD costs. So what’s the solution? Prevention is the best answer and it really comes down to one critical element. Your body is designed to MOVE. It does not do well with static postures for extended periods of time. 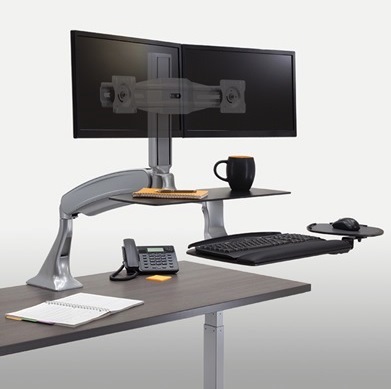 If you’re working at a desk with a computer in any capacity, an adjustable height workstation is your gold standard solution when combined with a monitor arm. 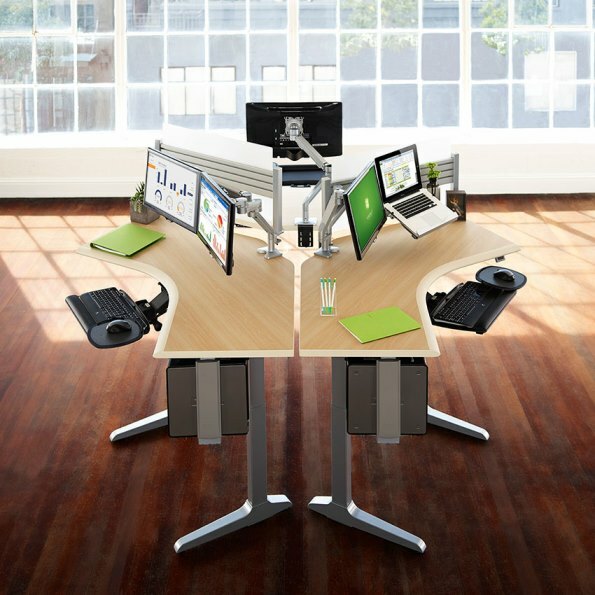 Based on your needs, this will allow you to alternate standing and sitting throughout the day. If you’re not able to use an adjustable height workstation, another good solution is to utilize a stack on unit that provides for almost the same flexibility as an adjustable table. Workrite’s Solace is one of the best on the market offering ergonomic features matched by few. For more information, I wrote this post earlier this year which explains in detail the functionality and benefits of this product. If neither of the latter options is an option and you’re using a fixed height desk, adding a keyboard platform and monitor arm still gives you the needed two points of adjustment to create an ergonomically correct workstation adaptable to your needs. To offset the potential of extended sitting, you will need to be all the more diligent in taking breaks where you stand up and move around. Einstein said the definition of insanity is “doing the same thing over and over again and expecting different results.” This is a truth I often share with clients experiencing pain due a combination of bad posture and a poorly designed workstation. Remember that if you’re experiencing pain, it comes with a price and will only get worse unless you’re willing to change. If you have doubts or questions about your posture or the ergonomics of your workspace, please don’t hesitate to reach out for help. As a Certified Ergonomics Assessment Specialist level II, I do assessments for my clients on a regular basis and always welcome new opportunities to serve. 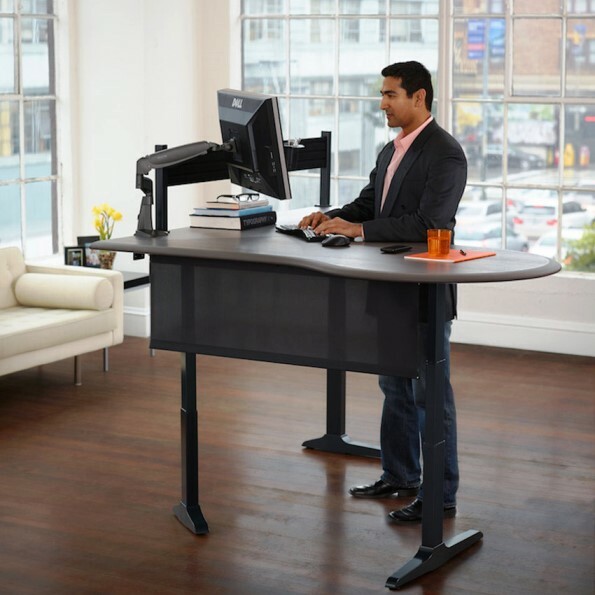 This entry was posted in adjustable height table, adjustable monitor arm, back pain, dangers of sitting, ergonomics, Health & Fitness, keyboard platform, musculoskeletal disorders, proper posture, Uncategorized and tagged #ergonomics, #wellness, adjustable height table, adjustable monitor arms, dangers of sitting, keyboard platform. Bookmark the permalink.